You probably have seen it by now, but a lot of people are doing the DNA testing by 23andMe. Even though I had wanted to do it for a long time, I never got around to actually doing it. So when I was given the 23andMe kit for Christmas, I was really excited! Inside the box is this plastic tube that you spit (yes, spit) into and then seal back in the box and mail back to 23andMe. Then after a few weeks, mine took less than a month during the busy holiday season, they send a few reports. These reports include where geographically your ancestry is from and also some health information about what your genetics may presuppose you to. Below is my report for where my ancestry is from and what the report looks like! I was actually shocked at the above report, I knew that a lot of my ancestry had come from Europe, I was just shocked that 99.6% had come from Europe! The other funny thing in the above report was that I was more Neanderthal than 62% of other customers. In middle school I was always laughed at for looking like a neanderthal (I thought I looked adorable), but I guess it was true! 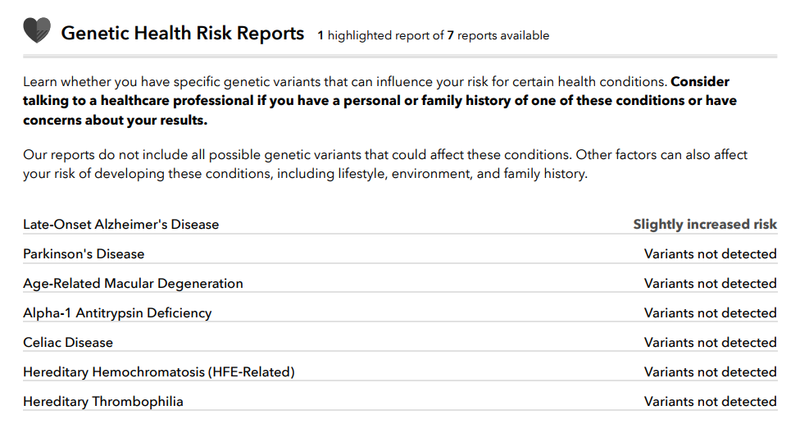 Beyond just the ancestry report, they give you some genetic health risk assessments. My report, as you can see below, came back very positive. The only "risk" that came back was a slight increased risk of "late-onset alzheimer's disease." The last report I got was a "wellness report." This report told me exactly what I was expecting... That I am addicted to caffeine and that I am a very light sleeper! So now I can officially blame my Mountain Dew addiction on my genetics! If you have not given 23andMe a shot, I really recommend it, just even for entertainment value. If you are interested, here is a LINK that will give you $30 off the kit!